Learn the parts of a voltaic cell. 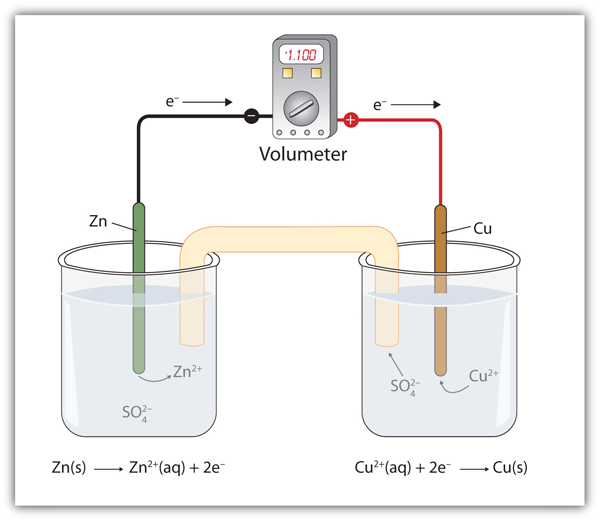 Combine half reactions to determine the voltage of a voltaic cell. Understand how voltaic cells are used as batteries. If you were to mix zinc metal and copper ions in a container, this reaction would proceed by itself; we say that this reaction is spontaneous. Suppose, however, we set up this reaction in a way depicted in Figure 14.1 “A Redox Reaction in Which the Two Half Reactions Are Physically Separated”. Zinc and zinc ions are on one side of the system, while copper and copper ions are on the other side of the system. The two parts are connected with a wire. One application of redox reactions requires that they be physically separated. Even though the two half reactions are physically separated, a spontaneous redox reaction still occurs. However, in this case, the electrons transfer through the wire connecting the two half reactions; that is, this setup becomes a source of electricity. Useful work can be extracted from the electrons as they transfer from one side to the other—for example, a light bulb can be lit, or a motor can be operated. The apparatus as a whole, which allows useful electrical work to be extracted from a redox reaction, is called a voltaic (galvanic) cell. Each individual system that contains a half reaction is called a half cell. The half cell that contains the oxidation reaction is called the anode, while the half cell that contains the reduction reaction is called the cathode. The cathode and anode collectively are the electrodes of the voltaic cell. Because electrons are coming from the anode, the anode is considered the negative electrode of the cell, while the cathode is considered the positive electrode of the cell. Finally, because electrons are moving from one half cell to the other, a charge imbalance builds up as the reaction proceeds. 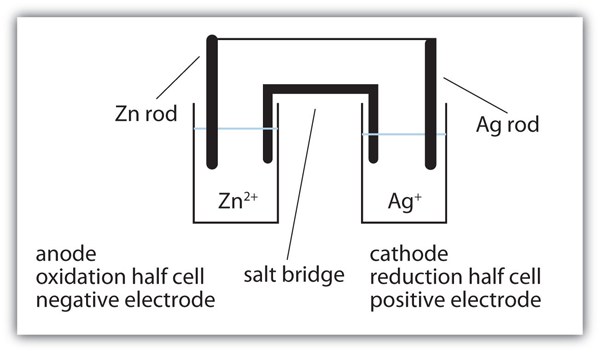 To counter that, a salt bridge is used; the salt bridge contains a solution of some ionic compound whose ions migrate to either side of the voltaic cell to maintain the charge balance. is assigned to be exactly 0.000 V under standard conditions of pressure and concentration. Table 14.1 “Standard Reduction Potentials of Half Reactions” lists some relative E1/2 values for some half reactions. Note that all half reactions are listed as reduction reactions, so these values are called the standard reduction potentialsThe voltage of a reduction half reaction relative to the hydrogen half reaction. of each half reaction. Table 14.1 “Standard Reduction Potentials of Half Reactions” lists only reduction reactions, but a redox reaction has a reduction and an oxidation. To make the oxidation reaction, simply reverse the reduction reaction in Table 14.1 “Standard Reduction Potentials of Half Reactions” and change the sign on the E1/2 value. If the reduction potential is negative, make the voltage for the oxidation positive; if the reduction potential is positive, make the voltage for the oxidation negative. What is the value of E1/2 for this half reaction? Therefore, the E1/2 of the given reaction is −0.222 V.
To determine the overall voltage of a particular voltaic cell, simply combine the voltages of the oxidation and reduction half reactions. Even if you need to take a multiple of a half reaction for the electrons to cancel, do not take the multiple of the E1/2. Use the values directly as is from Table 14.1 “Standard Reduction Potentials of Half Reactions”. Spontaneous redox reactions have positive overall voltages. If the voltage of the reaction as written is negative, it is not spontaneous in that direction. Rather, the reverse reaction is the spontaneous redox reaction. What is the voltage of a voltaic cell based on this reaction? Is the reaction spontaneous as written? Because the overall voltage is positive, the reaction is spontaneous as written. Technically, any redox reaction can be set up to make a voltaic cell. In modern society, however, only certain redox reactions are put to practical use. A portable voltaic cell that generates electricity to power devices for our convenience is called a battery. All batteries are based on redox reactions. 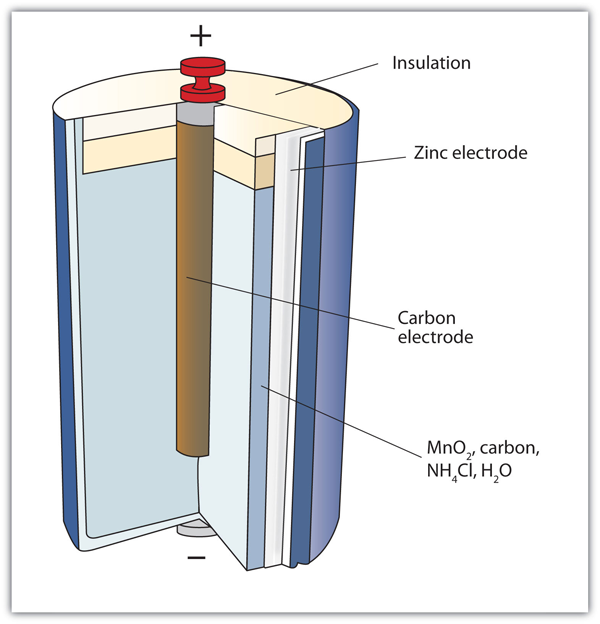 A dry cell has a voltage of about 1.56 V. While common and useful, dry cells have relatively short lifetimes and contain acidic components. They also cannot be recharged, so they are one-use only. Batteries that can be used only once are called primary batteries. The Leclanché dry cell is a common type of battery. Alkaline batteries have the advantage of being longer lasting and holding their voltage better—about 1.54 V—throughout their lifetime. The actual redox reaction depends on the composition of the cathode and is variable depending on voltage. Lithium batteries can also be used for applications that require more energy, such as portable computers and electric vehicles. Some lithium-based batteries are rechargeable and can be used over and over again; such batteries are called secondary batteries. 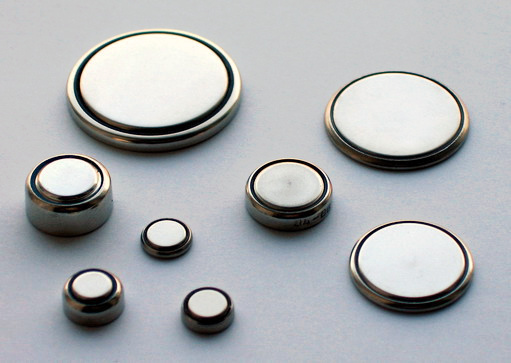 Button batteries like those seen here can be used for a variety of portable electronics, from watches and hearing aids to handheld gaming devices. Source: “Coin Cells” by Gerhard H Wrodnigg is licensed under the Creative Commons Attribution-Share Alike 2.5 Generic license. The redox reaction produces about 2 V, but it is typical to tie several individual batteries together to generate a larger voltage. The lead storage battery has the distinction that the product of both half reactions is PbSO4, which as a solid accumulates on the many plates within each cell. The lead storage battery is a secondary battery, as it can be recharged and reused many times. Because it is based on lead, these batteries are rather heavy. They should also be recycled when replaced so that potentially dangerous lead does not escape into the environment. Because of their characteristics, lead storage batteries are used to start large engines in automobiles, boats, and airplanes. A fuel cell is a type of battery in which reactants flow continuously into a specialized reaction chamber, and products flow out continuously while electrons are extracted from the reaction. Because all reactions in a fuel cell consist of a fuel and an oxidizer undergoing a redox reaction, an introduction of fuel cells is at home in a discussion of redox chemistry. This fuel cell uses H2 as the fuel and O2 as the oxidizer. However, fuel cells typically do not work under standard nor even optimal conditions, so they typically generate about 0.6–0.7 V. In this fuel cell, the only two products are water and electricity, so the fuel cell not only does not create pollution but also makes a by-product that in some environments is a valuable commodity (water). Other fuels can be used besides hydrogen; fuel cells have been developed that work on methane, methyl alcohol, ethyl alcohol, carbon-rich materials, and even magnesium metal. 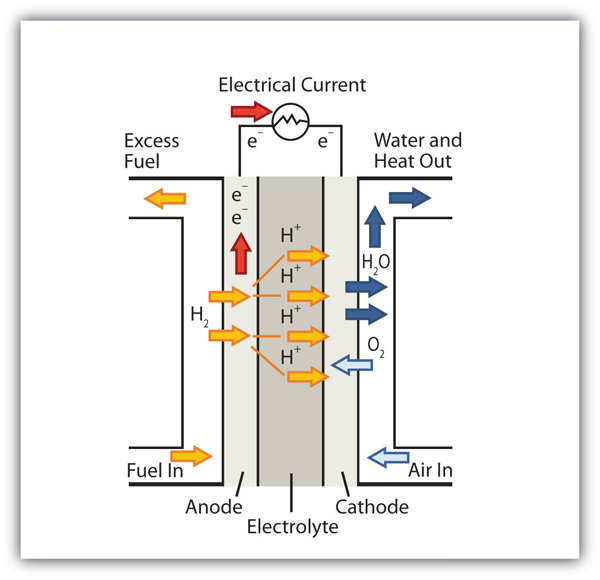 Hydrogen-based fuel cells were and are used to provide electricity for manned space vehicles, partly because their only chemical product is water, which could be used for drinking. However, there has been a recent resurgence in interest in fuel cells because of their potential use in electric cars. Most electric cars run on conventional batteries, which can be very heavy and expensive to replace. It is thought that fuel cells, rather than conventional batteries, might be better sources of electricity for automobiles. Several current barriers to fuel cell use in electric cars include capacity, cost, and overall energy efficiency. The 2008 Honda FCX, the first production model of a vehicle powered with a fuel cell, can hold 4.1 kg (just under 9 lb) of highly pressured H2 gas and has a range of 450 km (280 mi). It costs about $120,000–$140,000 to build, making the vehicle beyond the ability of most people to own. Finally, it always requires more energy to produce elemental hydrogen as a fuel than can be extracted from hydrogen as a fuel. As such, hydrogen is described as an energy carrier (like electricity) rather than an energy source (like oil and gas). This distinction points out a fundamental argument against fuel cells as a “better” power source. The 2008 Honda FCX was the first production car to use a fuel cell as a power source. Nonetheless, the car is in very limited service because of its need for relatively large quantities of elemental hydrogen as fuel. Source: Photo courtesy of vernieman, http://commons.wikimedia.org/wiki/File:Honda_FCX_2006_KLIMS_front.jpg. The limitations notwithstanding, there is a lot of interest in fuel cell research. If ways can be found to circumvent their current limitations, fuel cells may become more and more common as power sources. A voltaic cell produces electricity as a redox reaction occurs. The voltage of a voltaic cell can be determined by the reduction potentials of the half reactions. Voltaic cells are fashioned into batteries, which are a convenient source of electricity. Draw the voltaic cell represented by this reaction and label the cathode, the anode, the salt bridge, the oxidation half cell, the reduction half cell, the positive electrode, and the negative electrode. Use Figure 14.1 “A Redox Reaction in Which the Two Half Reactions Are Physically Separated” as a guide. What is the voltage of this half reaction? What is the voltage of the voltaic cell in Exercise 1? Consult Table 14.1 “Standard Reduction Potentials of Half Reactions” for data. What is the voltage of the voltaic cell in Exercise 2? Consult Table 14.1 “Standard Reduction Potentials of Half Reactions” for data. Balance this redox reaction and determine its voltage. Is it spontaneous? Which reaction represents the cathode reaction in Exercise 7? The anode reaction? Which reaction represents the cathode reaction in Exercise 8? The anode reaction? Which reaction represents the cathode reaction in Exercise 9? The anode reaction? Which reaction represents the cathode reaction in Exercise 10? The anode reaction? If the voltage of the cell is 0.33 V, what is the standard reduction potential of the Au+ + e− → Au half reaction? If the voltage of the cell is −0.72 V, what is the standard reduction potential of the V3+ + 3e− → V half reaction? What species is being oxidized and what species is being reduced in a dry cell? What species is being oxidized and what species is being reduced in an alkaline battery? What species is being oxidized and what species is being reduced in a silver oxide button battery? What species is being oxidized and what species is being reduced in a lead storage battery? Based on the data in Table 14.1 “Standard Reduction Potentials of Half Reactions”, what is the highest voltage battery you can construct? cathode reaction: Li+ + e− → Li; anode reaction: Al → Al3+ + 3e−13. cathode reaction: Cu2+ + 2e− → Cu; anode reaction: Ag + Cl− → AgCl + e−15. Applications of Redox Reactions: Voltaic Cells by Jessie A. Key is licensed under a Creative Commons Attribution-NonCommercial-ShareAlike 4.0 International License, except where otherwise noted.